The World Blockchain Forum and World Blockchain Award. Asia will be hosted on 22nd – 23rd June 2019 at Marina Bay Sands in Singapore. 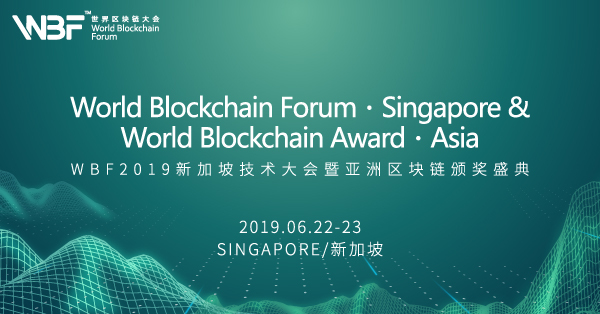 This is the second year of World Blockchain Forum Singapore and the 6th edition of WBF series. We are previously hosted in London, Singapore, Korea Jeju, New York and Shenzhen respectively. The intention was actually very simple. We are trying to be the resource aggregation platform where we could promote blockchain implementations and as well related information and partnership opportunities for all blockchain practitioners or such, facilitating the mass adoption for blockchain. We believe blockchain, just like the other edging technologies for example like AI, 5G, IOT etc. would be the key to enhance our quality of life and deliver convenience. We also believe that blockchain could bring financial inclusion to the world and improve poverty situation. We aim to become the premium platform benefiting the general public, investors, institutions, governments and all blockchain enthusiasts to connect, communicate and cooperate with each other. Our event features a massive number of audience, including blockchain and financial service practitioners from all over the world. We are delighted to provide a platform where all experts from different industries could gather and disucss the most trending topics around blockchain. The content includes trends, investments, technology and basically everything related to blockchain will beincluded at the event. We are also including more financial experts and traditional institutions this time as it is the time that they start to publicly apply and implement blockchain solutions to their daily business process, our event coud help us learn more about what they are doing, and raise awareness for blockchain application and adoption. Moreover we are collaborating with World Blockchain Award to host the greatest awarding ceremony within the blockchain sector. We aim to recognize and send our honor to those who have contributed to the industry. There are 6 awardsin total and registeration is almost closing. The competition within the industry is extremely fierce and we are honored to be the one sending our regards to these extrodinary individuals and organizations that had facilitated the mass adoption of Blockchain. For those attending, we have designed an interesting agenda, focusing on different perspectives as mentioned before, so that beginners, practitioners, investors, government representatives, developers etc. could all attend to these topics that they are interested in accordingly. It is also a great place for networking, socialing and learning from the eminent speakers that are from top companies. Most importantly, with our professional customer service team’s help, we would like all our participants to enjoy the event by getting involved. Who is speaking at it? Stay tuned to all our social media channels, website and our media partners! Contact us directly if there are any cooperation intentions or participation inenquiries. Moreover, tell us about the topics you would like to learn about, we might be able to put something in within our agenda! Tickets could be purchased from our official account on Huodongxing and Eventbrite. Tickets are being sold heavily already, usually being sold out around two months before the event.